Writer Simon Furman has been back on the blogging, with news of his appearances at the San Diego Comic-Con this coming weekend and for his next Transformers comic, All Hail Megatron #13, due out this week. Here’s Simon’s schedule for SDCC 09, so bringing along your books and other merchandise to get them signed. Friday 24th: may or may not make it along to the IDW panel at noon. News of my new TF series should already have broken by then, so I’ll be around (though maybe on the sidelines) to answer any (well, within reason) questions. Sat 25th: 3-4PM at the DC/Wildstorm stand, then 4-5PM at the DK booth (2913-G in the Lucasfilm Pavilion). I may have to run to be there on time!! Sun 26th: 10-11AM at the IDW stand, where I’ll be available to sign copies of All Hail Megatron #13 (and whatever else), then 2-3PM at the DK booth (Transformers: The Movie Universe, TF Ultimate Guide et al). That’s it for the moment. Keep an eye out for more updates, right here, over the next week! The Transformers: All Hail Megatron #13 is the start of 4 issues that contain 2x 11 page stories per issue. Simon’s story contains art from Don Figueroa, and features Optimus Prime and Ironhide. If you’re going along to Auto Assembly 2009 next month in the UK, look out for the exclusive cover for AHM #13. Transformers: Art of the Movies Still On Its Way? With all the Transformers: Revenge of the Fallen news, you may have over looked the fact that one piece of merchandise has disappeared off the radar. Transformers: The Art of the Movies, from Simon Furman, was due to feature lots of nice pieces of art from the 2 movies, but has not been seen since it’s original release date was 19th June, but it’s almost 2 weeks later with no news from the publisher Titan Books. The live action “Transformers” movie finally hit the big screen in 2007, and proved to be well worth the wait: a critical and commercial smash hit, it grossed over $700 million worldwide, and amazed audiences with its jaw-dropping special effects. 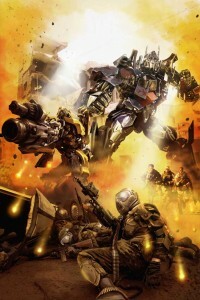 June 2009 sees the release of an even bigger sequel: “Transformers: Revenge of the Fallen”. But how did Director Michael Bay and his team pull it off, and make audiences believe these giant alien robots were real? Beginning with a concise history of “Transformers”, from toy to movie franchise, the book looks in depth at the making of both movies, with exclusive interviews and over 200 stunning images. Packed with previously unpublished concept and design art, this is a must for all fans! Simon Furman has responded to a question on his blog stating that it is awaiting approval. We assume most likely at the hands of Hasbro. As we reported yesterday, Simon Furman is writing the concluding script for the comic strip in Transformers Generations 2009 Vol. 3 with Guido Guidi contributing to the artwork. Now Guido has uploaded a piece of art onto his DeviantArt page. After years on working on Transformers books in the UK and USA, Simon Furman has now turned his attention to Japan. 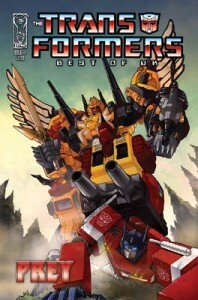 He has contributed a 2 page comic strip to Million Publishing’s latest book, Transformers Generations 2009 Volume 3, which is out in Japan later this year, ISBN 978-4-8130-2105-6. Art is done by Guido Guidi. The good news is that Simon will be providing a copy of his original English script, so there will be no need to translate the Japanese text, which will have already have been translated from this English script. IDW Publishing have revealed their next Best of UK series of comics, subtitled Prey. The 5 part series will collect together more of Marvel UK’s material, most likely the same material that was included with Titan’s UK book of the same name. Almost guarenteed is that the first issue with have Marvel UK issues #96 & 97, both titled ‘Prey’, which were written by Simon Furman. Here we have the brand new cover for the first issue, excellently done by Andrew Griffith. Simon Furman has taken the time to answer 20 questions put to him by fans. You’ll find discussion about revelation, Expansion and All Hail Megatron, what’s going on with The Thirteen and Beast Wars, and his general thoughts on Transformers and working for IDW. The first 15 are readable on the IDW forums, with the remaining 5 on his blog. After completing the script for The Transformers: Maximum Dinobots #3, Simon Furman has provided some information on the issue, which is due to be release in February 2009. The blog post has some spoilers, so only read if you’re likely to forget what happens before next year. Art is by Nick Roche with colours by Josh Burcham and issue #1 is currently looking beautiful!